Any old skipper with a sunburnt nose and fishy smelling fingers is bound to have fished aboard a Bertram. This 1988 Bertram 42 Flybridge is a case in point. It was the annual Cabo Hatteras Billfish Shootout off Port Stephens and we had been pounding into a sloppy nor’easter all morning. 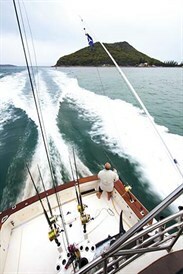 I was fishing aboard a 1988 Bertram 42 Flybridge named Molakai – a boat with quite the reputation for hooking big fish. Whether it’s for their looks, performance or pedigree – the older they are, the more renowned the classic boats they seem to get. This couldn’t be more accurate with the Bertram 42; the hull still holds its own in an arena of modern technology. You see, boats were different back in the ’80s; hulls were designed by salty sea captains that had sailed the seven seas, not computers. And they were built by master shipwrights that wore fibreglass dust on their skin like a carcinogenic coat of honour. Bertram boats have been around for donkey’s years. The first boat they ever built was a 31-footer called Moppie, and it won the 1960 Miami-Nassau Race in the worst weather conditions in the history of the event. It also broke the race record by four minutes! Bertram really did revolutionise the boating industry. Any old skipper with a sunburnt nose and fishy smelling fingers is bound to have fished aboard a Bertram, and has quite possibly owned one too. Although Bertram is an American brand, the 1988-built Molakai was actually manufactured in Melbourne, like most other Bertrams in Australia. In 1963, the Australian company International Marine was granted an exclusive manufacturing license to build, sell and export Bertrams. These days International Marine continues to build these outstanding hulls under the Caribbean brand for which tournament sponsor Game and Leisure Boats is a distributor. The 42, in particular, was first produced in 1984 and was built on the same hull as its classic predecessors. In my opinion, not much has really changed over the years. 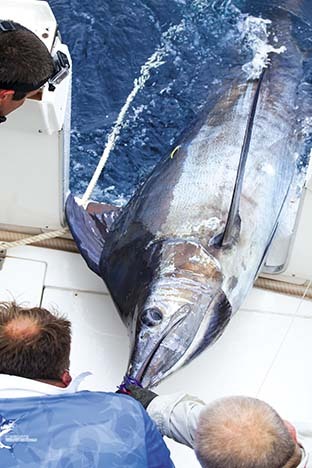 The hull of the 42 that I fished aboard is just as capable as many other modern sportsfishing flybridges. Of course it might not have the ride of a modern boat of that size but it’s certainly not going to fold under pressure when a storm front comes rolling in. Having been professionally upgraded by a shipwright, Molakai may be of an older vintage but her fishing kit suggests otherwise. 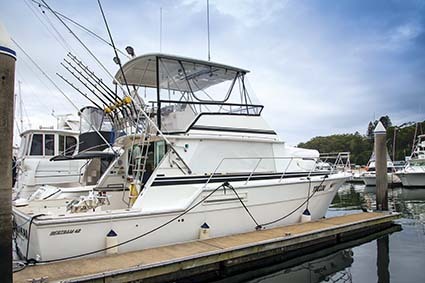 Featuring 20ft Reelax outriggers with well setup taglines, a comfortable 130lb Reelax gamechair, livebait tank and enough rodholders to put a Port Phillip Bay snapper fisherman to shame, this boat is seriously ready for screaming game reels. Minus the addition of fishing gear the cockpit is bare bones, maximising working space for big crews. It has a small rigging station on the starboard side and a big chest cooler to port. The top of the gunwales around the cockpit are finished in timber, which I love and wish more boats had these days. Upstairs on the bridge are a new 12in Garmin touchscreen, Simrad VHF and two Raymarine E80 screens and autopilot. These shaftdriven inboards will put hairs on the chest of even the weediest fisherman and send shivers up the spines of any nearby marlin. With 475 horses each side, the Bertram 42 moves along at quite a nice planing speed too. Although it isn’t that fast you wouldn’t say it’s slow either, the engines have done 1300 hours, which for a diesel is pretty much the run-in period. Molakai also features a 2700lt fuel tank that will keep you going for a few sessions and a 900lt water tank that should come in handy if the beer supply runs dry. The Bertram 42 may be a bit old school these days but in the eyes of any fisherman on the planet they’re like a son or daughter, always beautiful in their eyes. You don’t buy one of these boats for their aesthetics anyway, you buy one for its easygoing classic nature; a boat that makes fishing a breeze and boating safe. Although the Bertram brand is still well and truly alive overseas, in 1989 International Marine in Melbourne purchased the moulds, intellectual property and designs. They then incorporated all this into their own Australian-made product that you know as Caribbean. Find Bertram boats for sale.